Ask fellow campers about "Gold Brook Campground" and nearby attractions. Nice campground with really friendly staff. The sites are grass and are close together. We had no trees so no problem with getting satellite service. We had very weak TMobile service. There is free wifi available throughout Stowe. I ended up going to the library and working during the day. It worked out very well. We camped at Gold Brook Campground in a Travel Trailer. Location, location, location. We have a 40 MH so our options are limited, and this was the perfect base camp for our week in the Stowe area. For us, this campground was perfect because we weren't there to "camp". It's not nestled in the woods, it is an open grassy area but there are more trees than some other reviews have indicated. The openness allows for beautiful views of the surrounding mountains. We had a level spot. Some sites are closer than others, and we were pretty tight with the motorhomes on either side of us. But we didn't spend much time there, so it wasn't a big deal to us. The campground sits on the main road, but it's pretty quiet at night (except for road construction that happened to be going on at night while we were there). Making reservations and a couple follow up phone calls, plus check in, were maybe the most pleasant experience we've ever had - very friendly! We would definitely stay here again. We camped at Gold Brook Campground in a Motorhome. Several hikes, including Mt. Mansfield, are less than 20 minutes away. We enjoyed several things in Stowe - music in the library gazebo one evening, Art on Park another evening, creemees, strolling main street, Stowe Recreation Path...it's all five minutes away. We did a day trip to Montpelier, about 20 minutes away. This place was a great base for our trip to Stowe. Great experience from reservation to checkout. They had a water issue while we were there and tracked us down to let us know. Best cable service of any place we have stayed. This is a no frills place, if you are looking for events and activities go elsewhere. But if you are looking for a good base camp with good basic service this is a great place. We will be back the next time we pass through. We camped at Gold Brook Campground in a Travel Trailer. We made a spur of the moment decision to stay in Stowe overnight rather than deal with weekend traffic. Gold Brook looked nice from the outside, with lots of grass, but the facilities were terrible. Horrible showers, minimal laundry, and rude service. Next time we'll just keep driving. We camped at Gold Brook Campground in a Travel Trailer. Yes, the check-in person was pretty gruff but the park is a good place to stay, especially if you want to visit Stowe. We thought $49 was a bit much for a full-service back-in site on a grass field with spotty wifi, but hey, we just had one day to see Stowe. There are many trees sprinkled about the park but most are open sites. Many sites are right next to each other so you may want to request a site with some distance between you and your neighbor. And away from the road. Our wi-fi was ok but slow. I think we were in # 53 within site of the office. We camped at Gold Brook Campground in a Travel Trailer. Gold Brook Covered Bridge is a quick stop near the park.Stowe is a fairly typical ski town. We enjoyed walking the Rec Trail which starts behind the white church. Parking lot below the church. The Trapp Family Lodge. We missed the tour but enjoyed the 15 minute drive and a good lunch with a lovely view of the area. We enjoyed the touristy Cold Hollow Cider Mill, especially the apples for sale, the fresh apple donuts and hot loaves of bread. Pretty much everything other reviewers have written about the conditions of the park are true. We didn't have any trouble with the front desk or camp workers; we saw no evidence of rudeness or drinking mentioned by the previous reviewer. Four 50 amp sites are towards the back of the park with plenty of maneuvering room. We had #79 which is the last one and looks out over the open meadow. We are self contained and had no need to use the bathrooms or laundry. The park served us well as a base for exploring Stowe and the surrounding area. We stayed three nights. We camped at Gold Brook Campground in a Motorhome. Visit the welcome center and get maps and information on the area. There is a lot to see and do here. Enjoy!! The worst campground experience we've ever had. Staff is the rudest I have ever encountered. Rude on the phone, even ruder in person. Very over priced. Not at all a True Vermont experience. The No Refunds No Exceptions sign in the office should have been our first clue. Sites right on busy Route 100. Traffic kept the kids awake. Very out dated and very dirty. Owner and his groundskeeper appear to drink. Staff Very unfriendly. Not helpful. Thought it funny to give wrong directions to Ben & Jerry's Factory. WiFi did not work. Pay shower did not work. No money back! And after we checked out we stopped at the Coke machine only to be yelled at by the groundskeeper that the machine was only for campers staying there and we needed to leave. Will Never stay here again. Would recommend you keep driving right by! We camped at Gold Brook Campground in a Fifth Wheel. There is little to pick from in the Stowe area when it comes to RV campgrounds. This is one of the few campgrounds period, so there are many tent campers and RVs without shower facilities. That makes the bathrooms very busy. It would be easiest to give the positives followed by the negatives. 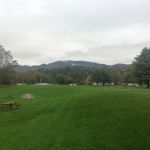 Positives: Location is very good, 2 miles from Stowe, 5 miles from Waterbury Center, and about 18-20 minutes from the Stowe Mountain Ski area without traffic. Price for site is not bad for a tourist region. No pull-thru sites but most sites are easy to get a larger vehicle into and fairly level. Some sites have trees, some are completely open. 50 AMP service is available to four of the sites. There are a few sites close to the road but most are away from the road and are very quiet. The cable connection pulls in many stations. Negatives: Campground road has several deep potholes, hard to avoid when pulling in. The bathrooms are very old and in serious need of remodeling. They appear to be in the original state when the campground opened at least 25 years ago. There is only one washer and one dryer for the whole campground to use. Sites are close together which is surprising based on the country setting. Wifi does not work if you are not close to the office. When it rains there are muddy spots due to need for gravel. I would recommend this campground mainly due to it's location and the quiet atmosphere. It lends itself well to young families with open play areas for sports and just plain running around. We camped at Gold Brook Campground in a Travel Trailer. By using your smartphone you can avoid the heavily traveled streets by cutting down back roads. Be sure to drive Rt 108 near the "notch." This route leads to Smugglers Notch State Park. Trailers or motor homes are out of the question on this stretch. A very pretty drive that goes for about 3 miles. We just drove 108 and turned around and drove back however there is an entrance to the actual State Park along the way. This CG is practically in Stowe, which gives it a great advantage. The sites are grass covered and ours was level. The owner was somewhat gruff, but not bad. Our wifi was non existant. The location makes this a good spot. We camped at Gold Brook Campground in a Travel Trailer. This is a beautiful campground with sites fully grassed. Water, sewer, electric, and cable all work great. Laundry, bathrooms, and showers are a disgrace. We use our bathrooms in our RV but the tenters do not have that option. The owner was a rude, unkind man both on the phone and in person. We would stay here again if in the area. It is so handy to attractions nearby. We camped at Gold Brook Campground in a Fifth Wheel. Abrupt Reception - felt unwelcome even though sites readily available (we had not booked and arrived at 5 pm) Grounds very pleasant but facilities old and in need of a good clean and/or renovations - would not be inclined to return. We camped at Gold Brook Campground in a Motorhome. This campground is in a large grassy area. Sites are grassy with some having a bit of gravel. Roads are gravel. Water/sewer/electric & cable worked very well. We could not get WIFI at the site at all and our Verizon Mobile Hotspot did not work very well. The location is perfect for touring Stowe and Waterbury. The sites seem to be close together, but the owner places you so that you have excellent space between units. There is plenty of room for maneuvering. The restrooms and showers need some serious attention, updating and deep cleaning. We liked it here and would stay again. We camped at Gold Brook Campground in a Travel Trailer. We were here after the summer time rush and found the owner very helpful and friendly. It is located behind a big red barn and the Nichols Lodge. We did not have any trouble with the power. Great location for seeing the fall colors and area. Most sites are on grass with some gravel. We did not use the restrooms. We camped at Gold Brook Campground in a Motorhome. Camp Ground is OK. One water tap shared for two sites. WiFi is at lodge next door. Owner is an awful drunk who is rude and seems to like giving wrong directions and then turns the sign (which faces the wrong direction anyway) off when you are coming in the dark. Told us to go up highway 10 and turn at the big red barn. It's on highway 100 and there are at least 5 big red barns -- it's Vermont after all -- and its not a barn, it's the Nichols Lodge. Lodges are for people, barns are for animals. There is a big Nichols Lodge sign - so he could have said, turn in at Nichols Lodge and we are behind it. We saw Nichols Lodge every time we drove by, but again ITS NOT A BARN. So, I have to assume he does it on purpose. And he seemed to lose phone connection whenever we asked for pricing -- and never would even give it to us in the office. So, we don't know what our options might have been. But it was then 10 PM, after we looked for it for over an hour, then unhooked the car and spent another 45 minutes looking for it in the car. I would never stay here again. We camped at Gold Brook Campground in a Motorhome. Lousy restrooms, would not use; in bad need of update or at least cleaning daily, not monthly. Power suspect; AC wouldn't fully power up, but did on our generator, however. Not worth half the price charged. Close to Stowe and Waterbury only pluses here. Will not return. We camped at Gold Brook Campground in a Motorhome. Gold Brook Covered Bridge is a quick stop near the park.Stowe is a fairly typical ski town. We enjoyed walking the Rec Trail which starts behind the white church. Parking lot below the church. The Trapp Family Lodge. We missed the tour but enjoyed the 15 minute drive and a good lunch with a lovely view of the area. We enjoyed the touristy Cold Hollow Cider Mill, especially the apples for sale, the fresh apple donuts and hot loaves of bread. Are you affiliated with Gold Brook Campground ?